You won’t want to miss Washington, DC’s hottest, family-friendly summer installation. 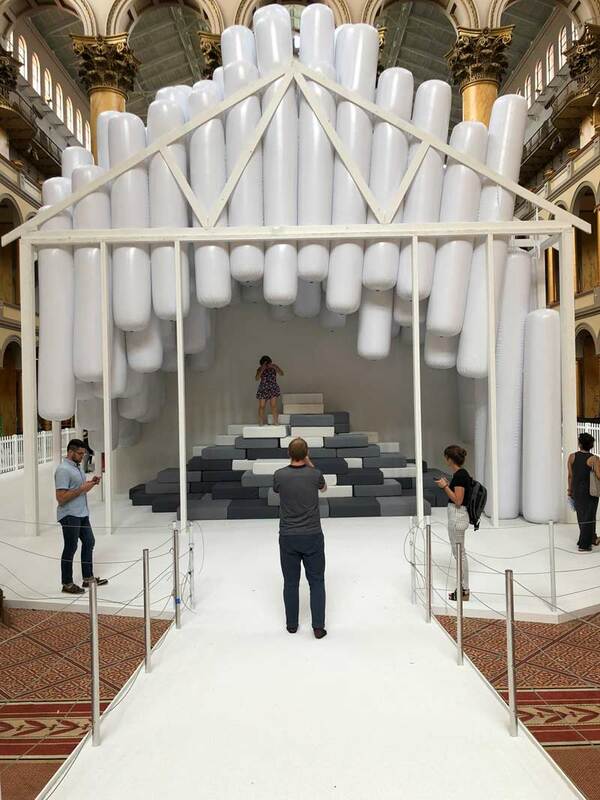 Each year, the National Building Museum hosts a Summer Block Party installation, part of an ongoing series that aims to showcase innovative museum experiences and the incredible design capabilities of the museum’s Great Hall. For the 2018 edition, the Building Museum enlisted Snarkitecture, a New York-based design practice that specializes in imaginative re-interpretations of everyday objects. That imagination is on full display with Fun House (open through Sept. 3), which combines many of Snarkitecture’s greatest hits inside a freestanding house, comprising the group’s first comprehensive museum exhibition. Fascinating reasons to visit this grand indoor construction are listed below, serving as a sneak preview of the dozens of wonders to be found inside Fun House. Fun House is like any house, in a lot of ways. There are front and back yards, a foyer, a playroom, a bedroom and bathroom, a kitchen, a study. However, Snarkitecture has turned these familiar stations of the house into interactive rooms that unveil an entirely new way of viewing the contemporary home. Another feature to note: nearly every aspect of the installation is white, essentially turning the structure into a blank canvas on which your own imagination can run wild. With its numerous responsive features, eye-catching minimalist design and picturesque settings that only look better with you situated in them, Fun House will garner much fanfare on social media through Labor Day. Make sure to use the hashtag #FunHouseDC (in addition to #MyDCcool) when sharing your adventures inside this can’t-miss summer attraction. A notion taken right out of science fiction or a David Lynch film can be applied to the infinitely engaging Fun House. Begin with what appears to be an entrance – but is in fact a piece on excavation known as Dig, which gives way to the foyer and creates an almost haunting effect as you enter the house. Each destination brings more revelations, as you ponder how Snarkitecture’s creations mimic or build on the characteristics of common rooms, utilities and furniture in the modern home. 5 The BEACH is back! 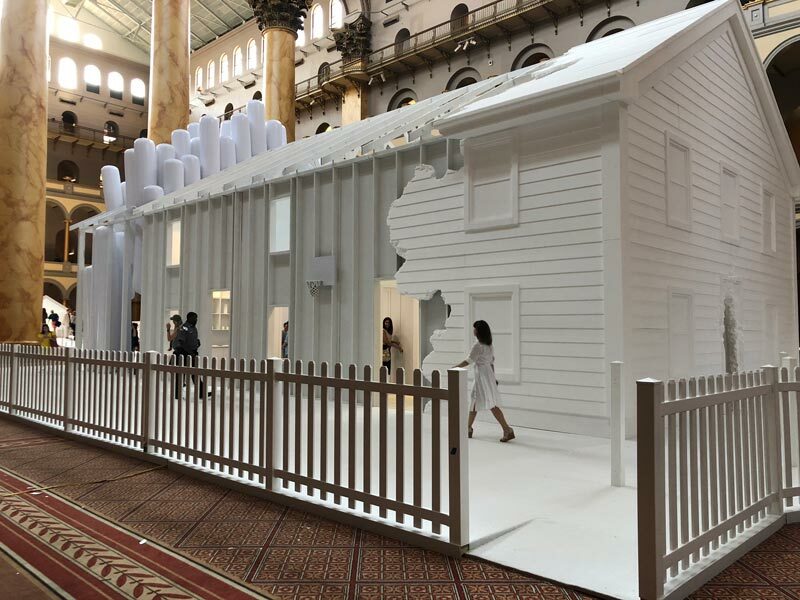 The very popular The BEACH served as the National Building Museum’s Summer Block Party installation in 2015 and many of its pieces have returned in 2018. 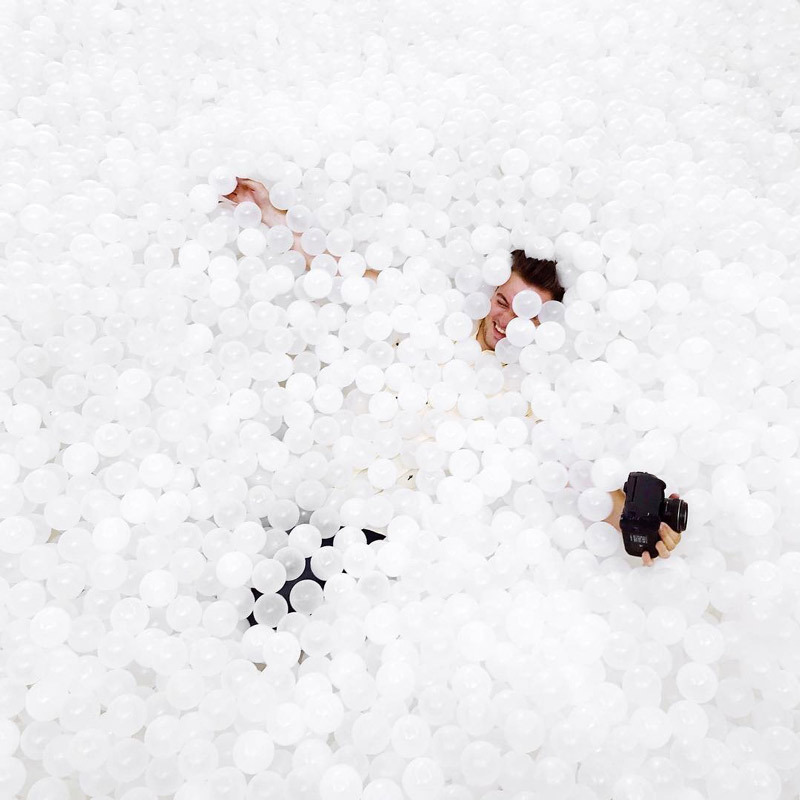 You can be immersed in translucent balls in the aforementioned Beach Chair, which doubles as a bath inside Fun House’s Bathroom. The Backyard is where The BEACH truly reigns, featuring a swimming pool, a hot tub and chairs for lounging. Fun House’s Backyard also features Playhouse, which appears to have immense depth, but instead uses forced perspective to highlight how people respond to scale and proportion differently. There’s also the Tilt Coaster in the Kitchen, normal and round until you place a drink on it – the top surface then angles while still supporting the object. The Kitchen also offers Slip Chair, which tilts toward the ground as if it’s falling over, but in fact uses a marble stone slab to right itself so it can be sat upon. There are several areas of Fun House that are fit for slowing down and taking a break. The Front Yard is a redux of Snarkitecture’s A Memorial Bowing, using soft cushions shaped like letters to spell out F-U-N H-O-U-S-E that double as very comfortable resting places. There’s also the Living Room, where you can hang out in Pillow Fort, which resembles any number of the upholstered forts you built in your childhood home. The Bedroom is entirely composed of Light Cavern, a piece that uses hanging white fabric strips to create a soothing environment, like that of any comfortable bedroom (there’s no bed, though). By the time you leave the National Building Museum, all of your senses will be satisfied, as Hill Country Barbecue Market has returned for another summer run of Backyard Barbecue. 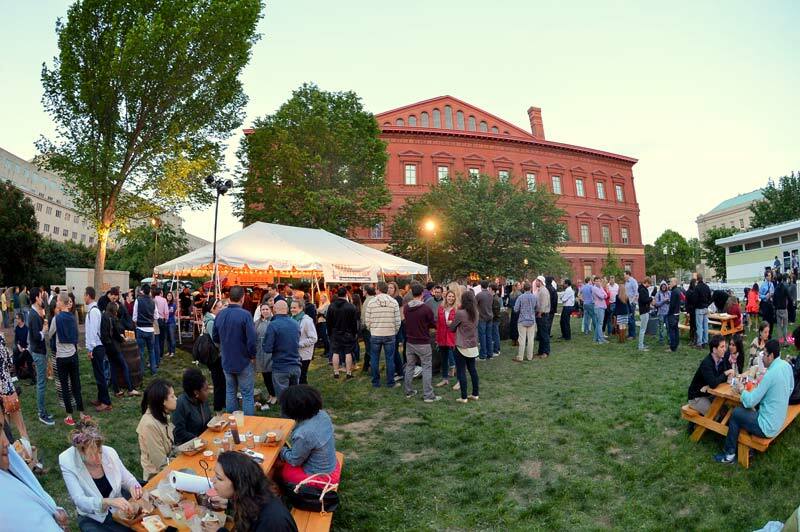 Throughout the duration of Fun House, the outdoor BBQ party will be open from Wednesday – Friday, 4-9 p.m. and Saturday and Sunday from 12-9 p.m. on the Building Museum’s West Lawn. Check out the and prepare for a delicious experience before or after you explore Fun House.